Scapegoating is projected here as an occurrence in justice systems of modern democracies. 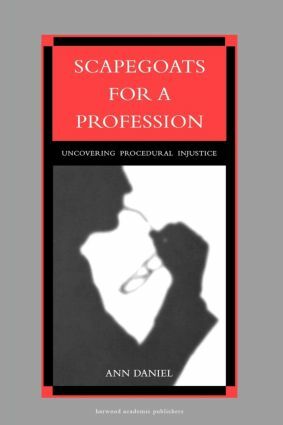 Daniel documents several disciplinary cases brought against successful professionals in law and medicine in order to do this, arguing that they are examples of community scapegoating by these professions.
" The issue addressed is universal, very current, indeed, so hot [as] to be glowing in the dark." " The argument, that inside the structures of modern rational-legal authority (the courts, the legislature) there exists a premodern form of social control in which groups pursue retribution (rather than restitution) is innovative, insightful and well rehearsed. It is an important challenge to the myth of 'modernity'." " It brings together key important aspects of professions-scapegoating, disciplinary practices and trust."